Sixth part of acclaimed serie. This time rather far from military tunes. 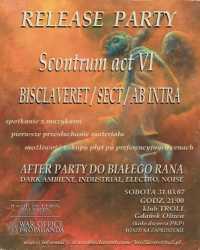 Three Polish acts - Bisclaveret, Sect and Ab Intra in mystic visions reflected in men's conflicts. Artwork based on reproductions of Dariusz Branski oil paintings. Limited to 369 copies, handnumbered. Adopting a quote from Friedrich Nietzche as name, this new interesting music entity rises from Recanati, Italy, same hometown of Der Feuerkreiner, with whom it seems to share a passion for epic, neoclassical and martial compositions. Scontrum is the extraordinary and well-received series of worldwide recognised dark ambient/industrial label War Office Propaganda / Rage in Eden. They have already released five installments which gained the cult status among the label's followers. The idea behind Scontrum is to split the release among three projects who present three unreleased tracks each. Scontrum was designed to appeal to music collectors not only through its content, but also unique sleeve - all installments are presented in a wooden A5 book-type format with additional pictures inside. This time the layout was prepared using replicas of Dariusz Branski's oil paintings. Part VI of this series will contain tracks of the following dark ambient / industrial projects: Bisclaveret, Sect and Ab Intra. Eight black anthems dedicated to the struggle for Light & Truth. Combining dark and ritual sounds with martial rhythms, choirs, piano & cryptic chants . A sweet indoctrination. Faith is Everywhere! In these words French act Organisation Toth, known from previous Old Europa Cafe and Athanor releases, is describing its newest album by War Office Propaganda. Lingua Fungi - "Tlapallan Pantonal"
Tlapallan Pantonal is a personal interpretation of Central American mythology. This album is inspired particulary by the myth of Quetzalcoatl - one of the most important and greatest gods of Mesoamerican Indians. More than utilizing the sound of native american music tradition, this record is made entirely around the mood that the Great stories personally evoked. Sounds vary from purely abstract ambient to acoustic folk passages. Yet another very interesting record of Lingua Fungi.